It was not long ago when tramp records founder tobias kirmayer discovered his love for jazz and its colorful varieties. his general affection for the analog recording technique is as evident as on the compilations predecessor‚ 'contemporary funk.' if you are familiar with the aforementioned album, you know that the focus is not only about the production/sound of the late 1960s but in at least the same extent on bands which have not yet had much musical output, if any. this, however, has nothing to do with the quality of the songs or the abilities of the musicians. for example, the cultures of rrhythm was nominated as jazz ambassadors of the united states in 2007. or the sugarman 3 have been professionally working in the music business for more than 15 years. connecting all bands is the deeply rooted love for jazz. what counts for them is that it all comes from the heart. therefore it is not surprising that despite the rich history of jazz recordings, their creativity and songwriting skills lead them to beautiful musical endeavors. indeed, they come close to touching the garment of jazz giants like john & alice coltrane, pharaoh sanders or jimmy smith. 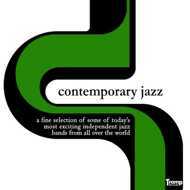 so the goal is quite obvious, this compilation is about to present a fine selection of handpicked songs to accomplish an even more unique mission: to prove that creative minds are still on this planet to keep real jazz alive - and 'contemporary jazz' is a testament to that.